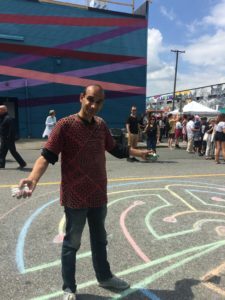 Himy Syed is likely to show up almost anywhere in the city studying what is going on and looking for an opportune time and place to bring out his sidewalk chalk and draw a labyrinth. I met him several weeks ago at the Strathcona Street Festival where he had drawn a large maze in the middle of the festival. I watched as children and adults that passed by stopped and entered the paths outlined in a variety of colours searching for their way out. As each person weaved their way through a network of turns and criss crosses, it was interesting to watch the differences in each person’s approach to this maze of colourful pigmented powder. Himy informed me that kids will often run through, almost always finishing as they make many decisions along their journey. The sense of accomplishment could be seen as most kids raised their arms into the air to celebrate completing their passage. He feels this puzzle is helping to build the resiliency of kids as they make decisions independently and celebrate their journey. Everyone seemed to be enjoying it no matter if they traveled the entire labyrinth or simply glanced at it as they passed by. He enjoys meeting so many people and having an opportunity to watch them as they navigate their way.